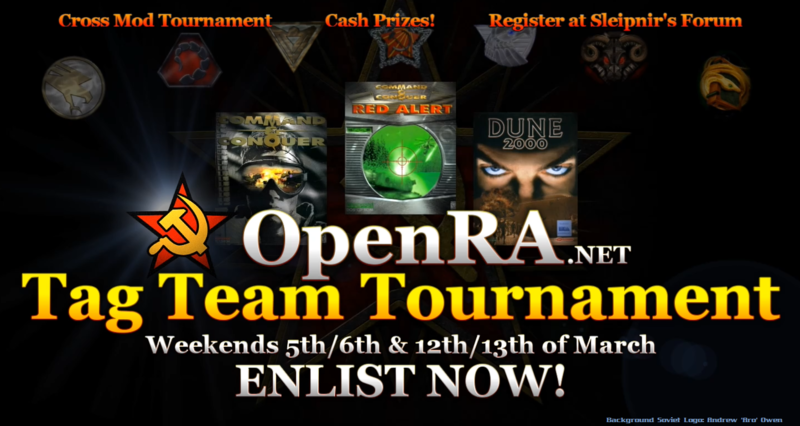 Our tournament officials has been hard at work organizing another OpenRA Tag Team Tournament! It will run March 5&6 and March 12&13 (on saturdays and Sundays). Thanks to the featured casters and the Gamereplays.com crew, there is a $200 pool to be split 80%-20% for first and second place respectively! As an added bonus, the winning team will be receiving a game on Steam (2 copies of the same game) by me. Each team will fight sets of 1v1s and 2v2s for each bracket match. Brackets will be arranged randomly. SoScared will not be streaming on his channel, but will join in as co-commentator. The announcement by FiveAces is pure awesome.